On these hot days, the kids are more thirsty than hungry, as are we. So how about some refreshing home made popsicles? They are quite easy to make. The kids can make them as an activity and then enjoy eating them. All round fun! 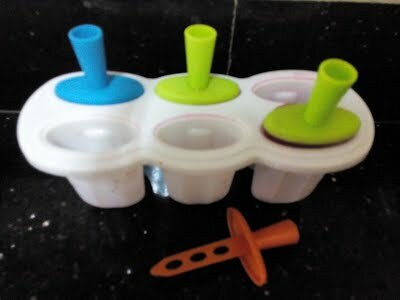 Super markets, or stores selling plastic wares, should have these simple popsicle trays, with the convenient sticks that fit in. The liquid freezes through the holes in the stick so the popsicle stays firmly attached to the stick. Even toddlers can enjoy eating them. They are messy but that makes them fun for the kids. Cleaning the mess is not too difficult. Just mop it up with a damp cloth. Dissolve 1 teaspoon castor sugar in a cup of water. Heating the water helps dissolve the sugar faster. Kids can do this in the microwave. Add the juice of half a lemon and stir. Cool the mixture to approximately room temperature. Pour the mixture in to the compartments of the popsicle tray, insert the sticks and leave them in the freezer for about 6 to 8 hours. Alphonso mangoes are unbelievably delicious and seasonal. No Indian summer is complete without them. So here is a popsicle recipe. Peel and isolate the flesh of two fully ripe alphonso mangoes. Kids can help with this. Heat half a cup of milk and dissolve a teaspoon of castor sugar in it. Put the mango flesh in the blender to make a pulp. Then add the milk and run the blender again to make a smooth paste. Take a quarter cup of water and heat it in the microwave. Then dissolve two teaspoons of castor sugar in it. Add the water to the mango paste. The mixture should still have a fairly thick consistency. 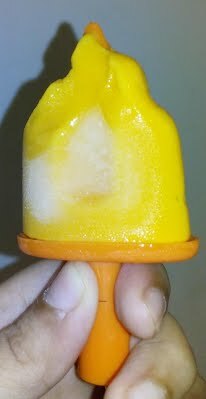 Now put it in to the popsicle trays to freeze and enjoy slightly creamy, intensely flavourful alphonso mango popsicles. The best ideas come from necessity. I had promised the kids that we would be making popsicles and set aside an orange for it. Papa had no idea and ate the orange. Now I had to come up with something. The only fruits in the house were apples, pears and a pomegranate. So I decided to try a pomegranate popsicle and it turned out great. Cut the pomegranate in to 4 pieces take out the seeds. Kids can help with taking out the seeds. My daughter had fun doing it. Then press the seeds with your fingers to squeeze out the juice. It is fairly simple to separate the seeds from the juice. If you have a more efficient way of juicing a pomegranate, please share. This was my first time. My daughter enjoyed the process, though. Then put a quarter cup of water to heat in the microwave and add 2 teaspoons of castor sugar. Pour it in to the vessel with the pomegranate juice and mix. 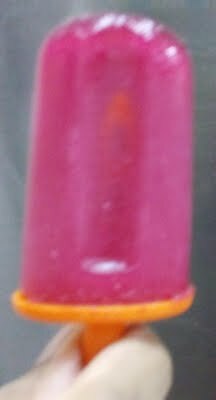 Pour the mixture in to the popsicle tray and enjoy bright purple pomegranate popsicles. This one is made of tea so you may not want to give it to really little kids. But moms, dads and older kids can enjoy it. I guess you could make it with coffee too. Make tea the way you like it. I love Darjeeling tea, because of its amazing aroma. 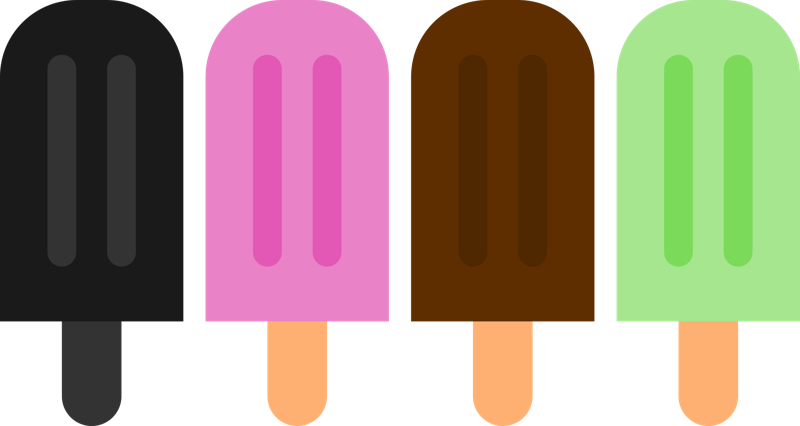 But for popsicles it is better to use one with a stronger taste like Assam tea. Bring 1 cup of water (for black tea posicles), or 1 cup of milk water mixture (for milky tea popsicles) to a boil. Add 1 heaped teaspoon of tea leaves and let it boil for a minute. Add 1 and half tea spoons of castor sugar and stir. Then let the mixture cool to room temperature. Stir often to make sure you don't get a layer of cream on top. Then pour in to popsicle trays and enjoy. Next we are going to try orange popsicles. If the oranges are sweet enough I wont add any sugar. I'll just make them with freshly squeezed orange juice and a little water. Lets see how they turn out. 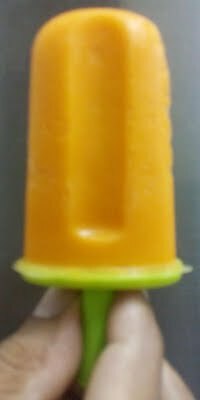 So this summer beat the heat with fruit flavoured popsicles made with real fruit and juice and the occasional tea or coffee flavoured one.